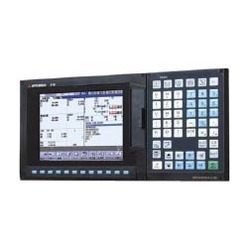 Leading Manufacturer and Supplier of CNC Controller such as Mitsubishi CNC M70, Mitsubishi CNC E70 and Mitsubishi CNC from Ahmedabad. We are a well-known organization that is engaged in offering high quality Mitsubishi CNC M70. The offered series is procured from our reliable sources after scouring the market. Moreover, this controller is available in various technical specifications as per the requirements of our respectable customers. Simple programming tools,"NAVI MILL" and "NAVI LATHE"
Ours is an illustrious organization that is engaged in offering optimum quality Mitsubishi CNC E70. Switching between lathe and milling systems is accomplished simply by changing a parameter in the offered range. All these products are sourced from vendors of high repute who use high quality components and spare parts. We are a renowned organization that is engaged in offering optimum quality Mitsubishi CNC. Offered controller is manufactured at vendor's end employing advanced technology in synchronization with the set industry standards. Owing to its suitable usage in various industries, the offered controller is highly demanded by clients. M 700 V Series' numerical processing performance and PLC processing performance have been significantly improved from those of our conventional M 700 Series.